Pre-inaugural events kicked off on January 19 with a wreath-laying ceremony at Arlington National Cemetery followed by two concerts entitled "Voices of the People" and "Make America Great Again" at the Lincoln Memorial. Voices of the People featured the DC Fire Department Emerald Society Pipes and Drums, King’s Academy Honor Choir, the Republican Hindu Coalition, Montgomery Area High School Marching Band, Marlana Van Hoose, Maury NJROTC Color Guard, Pride of Madawaska, Webelos Troop 177, Northern Middle School Honors Choir, American Tap Company, South Park and District Pipe Band, Everett High School Viking Marching Band, TwirlTasTix Baton Twirling, and Celtic United Pipes and Drums. Make America Great Again included remarks by Donald J. Trump and performances by Toby Keith, Jon Voight, The Piano Guys, Lee Greenwood, RaviDrums, 3 Doors Down, and The Frontmen of Country. The concert will also feature military bands and conclude with a fireworks display. The President of the United States was sworn in and officially took office on January 20, 2017. After a morning worship service, the oath of office was administered on the steps of the United States Capitol in Washington, DC. The Vice President took the oath of office at the same ceremony as the President. Following the swearing-in ceremony, the President gave his inaugural address, setting out his vision for America and goals for the nation. Performers included the Radio City Rockettes, Mormon Tabernacle Choir, and singer Jackie Evancho of "America's Got Talent. 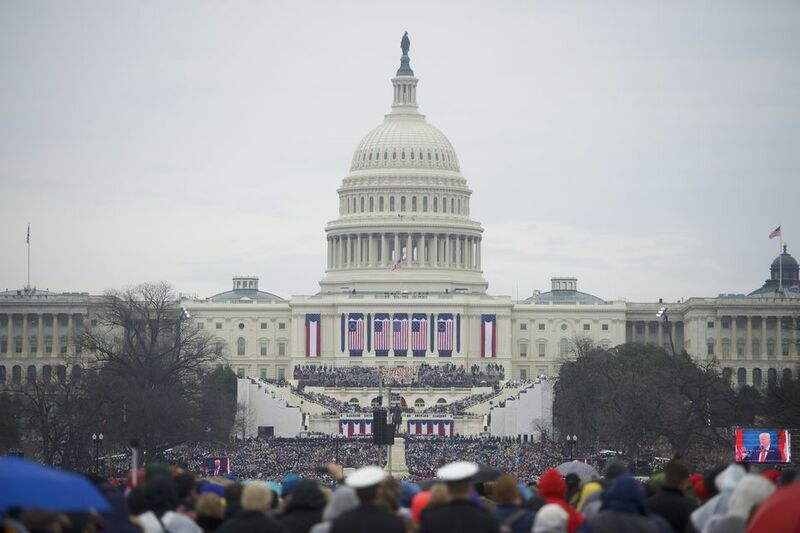 The Presidential Inaugural Parade followed the Swearing-in Ceremony. It was coordinated by the Armed Forces Inaugural Committee (AFIC) which includes members from all branches of the armed forces of the United States. Since 1789, the U.S. armed forces have participated in this important American tradition honoring our commander in chief. During the 10-day inaugural period from January 15 to January 24, 2017, armed forces personnel provided ceremonial support with musical units, marching bands, color guards, salute batteries and honor cordons. Read more about the Inaugural Parade. The Presidential Inauguration included just two official balls, plus one to honor the U.S. armed forces and first responders. Read about the 2017 Inaugural Balls. By Local Public Transportation: See a guide to Public Transportation in Washington DC. A number of groups organized protests, rallies and even anti-inaugural balls to empower and unite those opposed to the policies of the incoming President. The largest event planned was the Womens March on Washington scheduled for January 21, 2017. See the schedule of events. When visiting from out of town it is a good idea to do some advance planning and to learn about the “must” see attractions in the nation’s capital. For some expert advice, see Top 10 Things to Do (and 5 Hidden Gems) in Washington DC. Be sure to take some time to visit the Washington, DC's memorials. Book a sightseeing tour in advance to learn about the history of the city and its national landmarks. See a guide to the Best Washington DC Sightseeing Tours. Take some time to get off the National Mall, get away from the crowds and explore some of Washington, DC's neighborhoods. Book your hotel early to confirm a reservation and to get a good rate. Here are some resources to help you find a room to suit your needs.